Orange Pi PC is H3 based development board produced by Xunlong. The H3 SoC support has matured since its introduction in kernel 4.2. 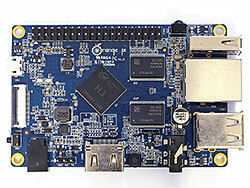 Most of the board functionality for boards such as Orange Pi PC are available with current mainline kernels. Some features (hw accelerated crypto, hw spinlocks, and thermal) are still being worked on. For a more comprehensive list of supported features, see the status matrix for mainline kernels. In addition, legacy 3.4 kernels are available in various work-in-progress git branches. Use the orangepi_pc_defconfig (supported since v2016.01) build target. The U-Boot repository and toolchain is described in the Mainline U-Boot howto. Use the sun8i-h3-orangepi-pc.dtb device-tree binary. The Orange Pi PC has a Raspberry Pi model B+ compatible 40-pin, 0.1" connector with several low-speed interfaces. Heat issues when using common OS images for the OPi PC. Without a heatsink the Orange Pi PC overheats easily and will drop cores to thwart further temperature increase and unfortunately the heatsink provided by the manufacturer does little to help. The low cost $15 variant does not have any heatsink included at all. This is the result of 'factory settings' overclocking/overvolting the H3 way too much. With adjusted dvfs entries and an upper limit of 1.2 GHz SoC temperature stays below 75°C without heatsink when running cpuburn-a7 on all 4 cores. Using a quality heatsink, some airflow and reasonable cpufreq settings the H3 remains below 60°C even under full load at an ambient temperature of 22°C. It is also possible to power the device via GPIO pin header: connect +5V to either pin 2 or 4 (both are connected to DCIN test point) and GND to pin 6. Then boot afterwards with this SD card inserted and H3 will be in FEL mode afterwards. An alternative way is to power the board from Pin2 (5V GPIO)whilst connected to RX/TX with a USB Serial TTL Spam '2' over the serial console. This will place the board into FEL mode - no SD-Card image required. Tested and works on Pi PC Plus. You can use "FAKE FEL BUTTON". See photo "H3_FAKE_BUTTON". According to the board's schematic UBOOT pin is connected to R124 (bottom leed, because top leed is connected to R38 which is connected to VCC). You can connect it to GND. The right R108 leed is the nearest GND pin (I've checked it). It is very close so it is not too hard. I draw it as yellow line. Enjoy! A red LED, connected to the PA15 pin. ; pmu_levelx: 0~9999: voltage(mV), 10000~90000:gpio0 state. voltage form high to low. It means that this comment likely originates from Allwinner, rather than something added by Xunlong or any other H3 device manufacturer. The Orange Pi PC board uses the SY8106A voltage regulator for providing the CPU core voltage (VDD_CPUX). The default CPU voltage is 1.2V after power-on (selected by the resistors on the PCB) and can be changed at runtime by software via I2C interface. According to the table above, this default voltage should be safe for using with the CPU clock frequencies up to 1008MHz. The H3 datasheet specifies 1.5V as the absolute maximum for the VDD_CPUX voltage and 1.4V as the recommended maximum. DRAM is clocked at 672 MHz by the hardware vendor. But the reliability still needs to be verified. One of the ways of doing reliability tests may be https://github.com/ssvb/lima-memtester/releases/tag/20151207-orange-pi-pc-fel-test (it checks the Orange Pi PC DRAM setup in the current mainline U-Boot v2016.01-rc2 + a bugfix). Orange Pi PC v1.2 (plaes) fel-boot-lima-memtester-on-orange-pi-pc-v3.tar.gz 648 MHz 672 MHz No heatsink. Multiple reproducible failures. User:Runnerway's Orange Pi PC fel-boot-lima-memtester-on-orange-pi-pc-v3.tar.gz 672 MHz 696 MHz Small heatsink. User:Camh's Orange Pi PC 1 fel-boot-lima-memtester-on-orange-pi-pc-v3.tar.gz 744 MHz 768 MHz Heatsink (35mmx25mm) covering SoC and RAM. 768MHz failed < 1 min. User:Camh's Orange Pi PC 2 fel-boot-lima-memtester-on-orange-pi-pc-v3.tar.gz 696 MHz 720 MHz Heatsink (35mmx25mm) covering SoC and RAM. 720MHz failed after 5 mins. User:Camh's Orange Pi PC 3 fel-boot-lima-memtester-on-orange-pi-pc-v3.tar.gz 696 MHz 720 MHz Heatsink (35mmx25mm) covering SoC and RAM. 720MHz failed after ~30 mins. User:Camh's Orange Pi PC 4 fel-boot-lima-memtester-on-orange-pi-pc-v3.tar.gz 672 MHz 696 MHz Heatsink (35mmx25mm) covering SoC and RAM. 696MHz failed in < 30s. User:Michal's Orange Pi PC fel-boot-lima-memtester-on-orange-pi-pc-v3.tar.gz 696 MHz 720 MHz No heatsink. At 720 MHz test failed in about 5 minutes. User:Jvdwaa's Orange Pi PC fel-boot-lima-memtester-on-orange-pi-pc-v3.tar.gz 720 MHz 744 MHz No heatsink. User:dusthillguy's Orange Pi PC fel-boot-lima-memtester-on-orange-pi-pc-v3.tar.gz 672 MHz 696 MHz Only one 14mm*14mm*5mm heatsink, fitted on the H3 chip. Stable at 672 for over 12 hours without a fan, the green led was still flashing when I powered the system off. Fails within 30 to 60 minutes at 696 without a fan. At 696 with a fan, it survives for a few hours, but even with the fan it does eventually fail (the LEDs go off). By the way, the fan I used is 70mm, taken from an old intel heatsink, and powered by USB, so it rotates at a low speed. Just in case this is useful to know. kc's Orange Pi PC fel-boot-lima-memtester-on-orange-pi-pc-v3.tar.gz 648 MHz 672 MHz No heatsink. stable for ~35minutes of testing at 648 (to the red led), failing within 1-2 minutes at 672. User:dvl36's Orange Pi PC fel-boot-lima-memtester-on-orange-pi-pc-v3.tar.gz 720 MHz 744 MHz Heatsink (35x35x25mm) covering SoC and RAM. 744 MHz fails after ~2 minutes. User:cosm's Orange Pi PC fel-boot-lima-memtester-on-orange-pi-pc-v3.tar.gz 648 MHz 672 MHz 22mm*22mm*10mm heatsink on the SoC only. 672 MHz worked until the red LED lit, but failed after about two hours. 648 MHz was still working after 10 hours. User:hp197's Orange Pi PC fel-boot-lima-memtester-on-orange-pi-pc-v3.tar.gz 696 MHz 720 MHz Heatsink (13x14x6.5mm) covering only SoC (Ebay Link). 720Mhz Failed quick after start (at the bit flip test, 1st pass). User:emsi88's Orange Pi PC fel-boot-lima-memtester-on-orange-pi-pc-v3.tar.gz 672 MHz 696 MHz With big heatsink . 696 Mhz Failed afrer few minutes, 672 MHz worked stable for over 9 hours. User:lampra's Orange Pi PC fel-boot-lima-memtester-on-orange-pi-pc-v3.tar.gz 648 MHz 672 MHz No heatsink. 672 Mhz Failed afrer few minutes. User:Euros's Orange Pi PC Plus fel-boot-lima-memtester-on-orange-pi-pc-v3.tar.gz 648 MHz 672 MHz No heatsink. 672 MHz failed after 50 minutes, 648 MHz was still working after 20 hours. We need still more test results in the table above in order to have more accurate statistics and finally pick a safe default DRAM clock speed for U-Boot. Preferably there should be at least 10 entries in the table (more is always better). And there are no "good" or "bad" test results. Even if your result looks very similar to the already reported results from the other people, please still add yours to the table! Because if people don't feel like reporting their "boring" results, then "interesting" outliers will unfortunately skew the statistics. Thanks! Below is an intermediate analysis of the currently reported results, using the lima-memtester-genchart script (run the script using this page URL as the command line argument). Assuming that the Gaussian distribution is a good approximation, try to predict what percentage of boards is expected to pass the lima-memetser test at different DRAM clock frequencies. The lima-memtester page provides more information. ↑ If nothing is known about the distribution of samples, then at least Chebyshev's inequality can be used to get a rough idea about the probabilities of encountering reliability problems at different DRAM clock speeds. But this method is very conservative and substantially overestimates probabilities (being too generic has its price). If the p-values listed above happen to be too low (less than 0.05) and reject our null hypothesis about having the Gaussian distribution, then Chebyshev's inequality estimates still can be used. Also named as AR100, CPUS and "arisc" in various Allwinner materials, which may cause a bit of confusion. According to the Orange Pi PC schematics, VDD_CPUS is connected to VDD_RTC. It means that the voltage powering the OpenRISC core is programmable via the hardware register VDD_RTC_REG (at 0x1F00190) and can be configured between 0.7V and 1.4V. The H3 datasheet says that 1.4V is the absolute maximum for VDD_CPUS and 1.1V-1.3V is the recommended range. The reset default for VDD_RTC voltage is 1.1V. 1.1V 552 MHz 456 MHz 528 MHz 432 MHz ? 1.2V 624 MHz 504 MHz 600 MHz 480 MHz ? 1.3V 624 MHz 504 MHz 600 MHz 480 MHz ? Without I-Cache, fetching each instruction from SRAM takes 3 cycles instead of just 1. Please note that the intended use of the OpenRISC core in Allwinner devices is keeping a watch while the main Cortex-A7 CPU and the rest of the SoC peripherals are powered off in deep power save modes. In this usage scenario it is likely clocked at just the minimum possible clock frequency 32 KHz. Xunlong sells also a cheap 2MP camera (an attempt to fix the driver's limited resolutions can be found here). Unlike Orange Pi Plus/2 that can directly connect to the camera module for the PC an 'expansion board' is needed (see gallery below). If you order from Xunlong simply say that you need the camera for Orange Pi PC and they ship camera together with the small board. After applying a  to the lichee kernel sources 1-wire can be used with H3 based Orange Pi's. After loading the approriate modules (w1-sunxi, w1-gpio and w1-therm) connected 1-wire slave devices should appear below /sys/bus/w1/devices/. To let 1-wire work the GPIO pin to be used has to be defined in fex/script.bin. All OS images that applied the 1-wire patch (all from loboris after applying his latest fixes, Armbian or the community's OpenELEC build) use "gpio = 20" in the fex file. Attention: This is a logical mapping that correlates with physical GPIO pin 37 (see the gallery image below). Please keep this in mind when following 1-wire tutorials for Raspberry Pi where GPIO pin 7 is normally used. On H3 devices the pin to connect the data line to is on the other end of the GPIO header. According to schematics v1.2 plug config is: (tip) Right-Left-Video-Gnd (cable). The UART pins are located between HDMI and power jack of the board. On some boards they are marked as TX, RX and GND on the PCB (simplified layout: ..DC-IN.. [GND][RX][TX] ..HDMI..). Just attach some leads according to our UART Howto. The Orange Pi PC Plus adds 8GB eMMC and Realtek RTL8189FTV SDIO-based WiFi directly on the board (as opposed to a soldered-on module). The physical dimensions and position of connectors are exactly the same as the Orange Pi PC. The same type of DRAM is used but tracing is different since one DRAM module moved to the bottom side of the PCB. Since a FEL button is missing on this board it's not that easy to verify DRAM reliability the usual way (through FEL boot) so we should stay with the failsafe value of 624 MHz DRAM clock. Regarding software support we can base on fex file and device tree for the PC and simply add the necessary WiFi chip mappings. A various amount of prebuilt images is provided via OrangePi's Website most of them not containing latest fixes. Many people are also running images generated by forum user loboris (mirror available). It should be noted that when using loboris' images it's always useful to execute his update_kernel.sh to get latest kernel fixes and settings for the board in question (various script.bin variants for different Orange Pis and display settings). To adjust script.bin settings (overclocked/overvolted) to linux-sunxi defaults there's informations and a script available in this thread. This page was last modified on 4 December 2018, at 05:33. This page has been accessed 210,609 times.